It’s almost Chanukah if you can believe it! These tasty little pancakes are perfect for the holiday and really any day. Most perfect of all is that you can cook them, freeze them and have them for whenever you want. They make a great appetizer or side dish. My experience with latkes is that they never really taste as good as when you first fry them, but that’s such an impossible task with people waiting to eat and having fifty million other things to do. 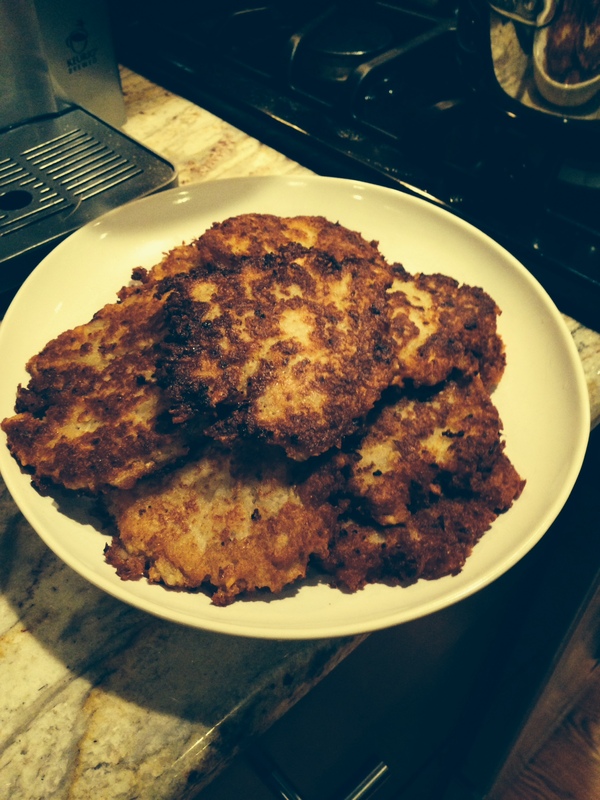 Latkes are the ultimate comfort food. This is just a little twist on the traditional potato latke . Usually about 2 – 2 1/2 inches in diameter is the right size, but it’s up to you. Not sure where this recipe hails from. The original from my Grandmother, but the zucchini was added later. My grandmother didn’t own a food processor and it’s a game changer, just makes it so much simpler to do. I loved my Grandmother’s latkes and not quite sure what she did to make them so delicious but I try my best. If you’re not into the zucchini thing just add 2 more potatoes and omit the zucchini. Delicious served with applesauce , that’s how we do it here. Using the grater blade for the food processor, grate the onions, potatoes, and zucchini. A little trick to these latkes is to drain out as much of the liquid as possible, so I literally squeeze out every drop of liquid with my hands. I let each vegetable sit in a colander to drain as I grate the next one. In a separate bowl, beat together the eggs, salt and pepper. Add it to the potato mixture and combine well. Next, add the matzoh meal or bread crumbs. Taste for salt (start with 1 teaspoon and add more if needed, this is very important for flavor. Heat oil in a large, heavy skillet or cast iron skillet, over a high flame. You want the oil very hot. I test the oil with a drop of water–when it sizzles, it is ready to fry. I put about 2 inches of oil in the pan, you may need to add more as you start frying. Form pancakes about 2 inches in diameter, place (very) carefully into the oil, and when the edges start to crisp up, turn them over and continue cooking until golden. If you like them flat and crispier, then flatten them out with a spatula while cooking and start with a little less. *I like the oil to be clean as I fry a lot, so if it starts to run down I usually pour it out, wipe pan with paper towel and add fresh new oil. This is only in the event the oil starts to get very dark from the potatoes. It may not be necessary but sometimes it is. They will just fry up better. Let the pancakes cool off, and serve plain or with sour cream or applesauce on the side. If you are freezing them, let cool completely first, then I usually use a Hefty Ziploc freezer bag. Mark them with the date, and take them out the night before you need them. They should stay for at least a month in freezer, and probably longer. *to re-heat I like to use the oven at 350 degrees on a cookie sheet for about 15 mins. depending on how thick they are. Spray the cookie sheet with Pam Spray and you may want to flip them over 1/2 way through. Make sure they are heated throughout. Serve with some of that homemade applesauce on my blog. Enjoy! It’s Chanukah if you can believe it! These tasty little pancakes are perfect for the holiday and really any day. Most perfect of all is that you can cook them, freeze them and have them for whenever you want. They make a great appetizer or side dish. My experience with latkes is that they never really taste as good as when you first fry them, but that’s such an impossible task with people waiting to eat and having fifty million other things to do. 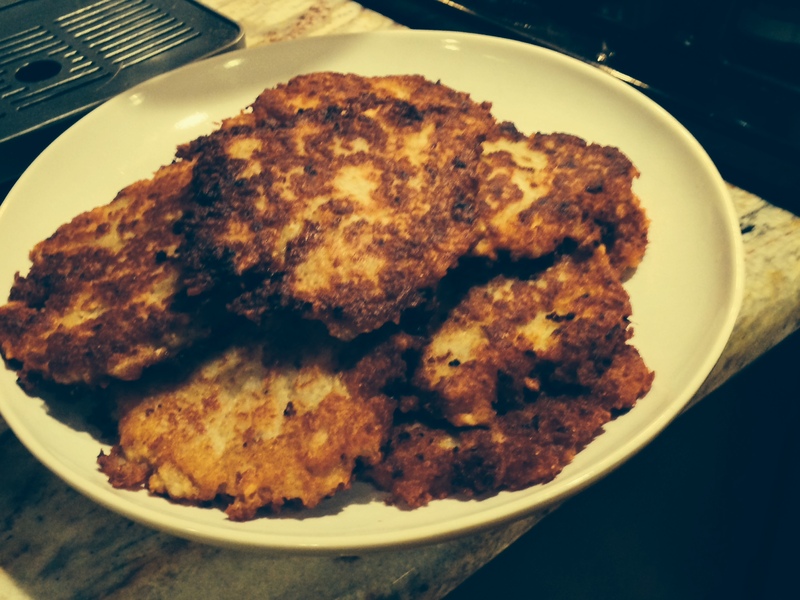 Latkes are the ultimate comfort food. This is just a little twist on the traditional potato latke . Usually about 2 – 2 1/2 inches in diameter is the right size, but it’s up to you. Not sure where this recipe hails from. The original from my Grandmother, but the zucchini was added later. My grandmother didn’t own a food processor and it’s a game changer, just makes it so much simpler to do. I loved my Grandmother’s latkes and not quite sure what she did to make them so delicious but I try my best. *I like the oil to be clean as I fry so if it starts to run down I usually pour it out, wipe pan with paper towel and add fresh new oil. This is only in the event the oil starts to get very dark from the potatoes. It may not be necessary but sometimes it is. They will just fry up better. Chanukah is here if you can believe it! These tasty little pancakes are perfect for the holiday and really any day. Most perfect of all is that you can cook them, freeze them and have them for whenever you want. They make a great appetizer or side dish. My experience with latkes is that they never really taste as good as when you first fry them, but that’s such an impossible task with people waiting to eat and having fifty million other things to do. Latkes are the ultimate comfort food. This is just a little twist on the traditional potato latke . Usually about 2 – 2 1/2 inches in diameter is the right size, but it’s up to you. Not sure where this recipe hails from. The original from my Grandmother, but the zucchini was added later. My grandmother didn’t own a food processor and it’s a game changer, just makes it so much simpler to do. I loved my Grandmother’s latkes and not quite sure what she did to make them so delicious but I try my best. If you’re not into the zucchini thing just add 2 more potatoes and omit the zucchini. My daughter Jennifer made these with no zucchini and said they were amazing. I posted her pictures of her potato latkes.